Everyone is in official freak out mode. It’s like mother nature is passing out crackÂ to everyone. People are running around, gushing and cryingÂ over pumpkin bread, pea coats, and falling leaves. I have to say, I have a love/hate relationship with this time of the year. 1. Thanksgiving is the only time of the year where people don’t expect me to cook or bake for them. Amen. …don’t get me wrong, I obviously love cooking and baking.Â It’s just that a lot of people tend to expect something from me/ask for handouts. We also need an occasional break, even from the things we love. So this is the one time when somebody feeds ME. Awesome. 2. Halloween night. Dressing up in epic costumes. …Let’s face it. If you are in your early thirties or younger, this is your once-a-year opportunityÂ to dress like a whore and get away with it. If you are older than thirties and still dress like a whore, then bravo. Even some of the men try to dress like whores. The typical process is to take whatever concept you are dressing up as and insert, “slutty” before it. Â sluttyÂ Â Â Â Â Â hookerÂ Â Â Â Â Â Â Â Â Â ..?.?.? This stuff is hilarious. It’s not just the costumes, it’s the candy too. If you read my blog, you know I have a sweet tooth. Then there is a part of me that absolutely loathesÂ every second of the fall. 1. If you think leaves are so pretty, then when I move out of the city and have a yard I will personally invite you over to rake them. Raking leaves was the most annoying chore growing up because the rake is not an effective tool. There were always leaves left behind. Darnit. 2. Fall means we are closer to winter. The temperature is beginning to drop. Dropping temperature and winter nearing means snow, darkness, misery. Screw you fall and your ripping the warm summer weather away from my tight and desperate grip. Now if you live in a warmer area of the US like, say, California or Florida, then you don’t have a real fall to begin with. 3. Some people get all excited about wearing scarves and warm, comfy clothes. I look at it as finding my missing glove, bundling up until I can’t breathe, scratchy materials and breaking out in rashes.Â I will beÂ spending triple the amount of money for a full outfit. Now why would anyone want to do that? 4.Â Fall is a very cruel time of year. Once a year, millions of people collect these poor creatures and stab them to death right in front of their own children’s eyes.Â Afterwards these creatures areÂ gutted andÂ even worse, put on display for others to witness the result of theirÂ torture.Â This is a serious problem that our country has swept under the rug for too long. 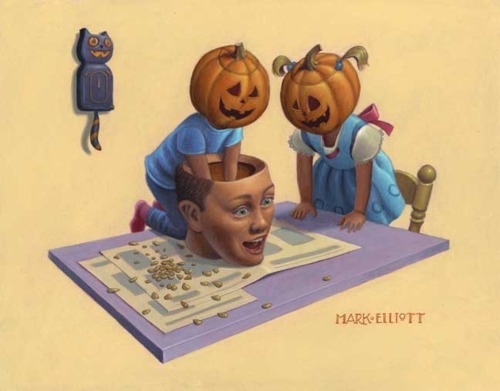 We as a society have focused on animal cruelty, but what about the pumpkins? WARNING: The images you are about to see are graphic and violentÂ in nature. Viewer discretionÂ is advised. I understand that this is difficult to look at, but we must face the truth of our mistakes. 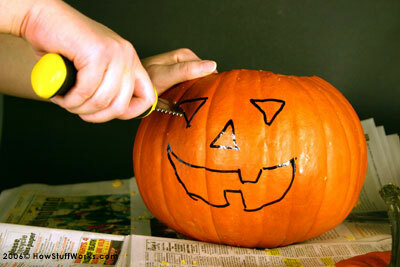 This image is just one example of thousands of ways people torture and mutilate these defenseless pumpkins. For those pumpkins who are able to surviveÂ the torture, they are held as prisoners in people’s yards. Here is an example of a prisoner who was forced to murder his own flesh and blood. Although he is still alive, the emotional stress will last with him forever. 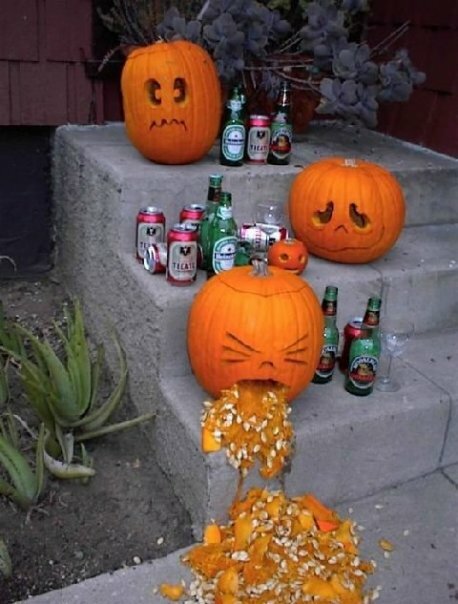 These pumpkin creaturesÂ have resorted to a life of alcoholismÂ and substance abuse as a means of coping with the post traumatic stress disorder. They will be scarred and mutilated for the duration of their lives. 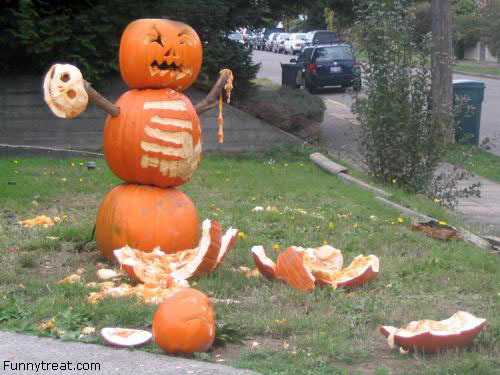 Some pumpkins aren’t so lucky. This baby pumpkin was murderedÂ for its skin, which is a high priced commodity in the fashion industry. 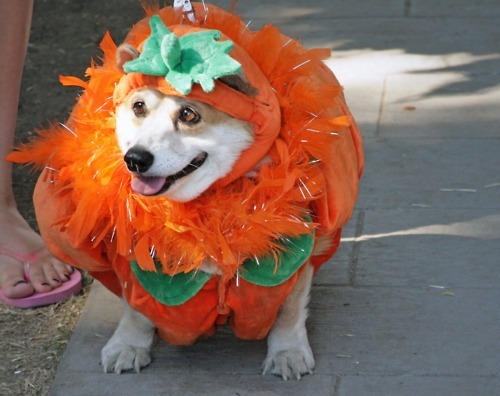 An organization named PETA…P (People for the Ethical Treatment of All… Pumpkins) isÂ infamous forÂ splashing paint ontoÂ anyoneÂ wearingÂ pumpkin skin. Watch out, you little pug, you. You’re next. I believe this is a case in whichÂ the pumpkin and the dog are both victims. 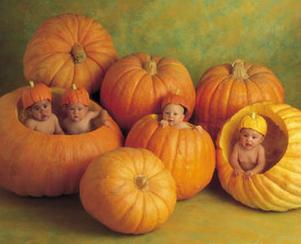 A bunch of babies posing with giant pumpkins. A rarity amongst the pumpkin species, and therefore priceless. Their intenseÂ size and the abilityÂ to make miniature things (such as babies) appearÂ even more miniature, make them even more desirable to humans. PETA…P is currentlyÂ campaigning against pumpkin poachers inÂ the wild farms of Vermont. It’s only a matter of time before they become extinct. Once the skin is used, people often use their insides for consumption. Even Starbucks uses pumpkin guts for their own profit. Have you no shame?? If we don’t pay attention to this problem, the pumpkins could become extinct. Even worse, they could start a revolution and wage war against human kind. Be warned, people. One day the tables could turn. For every one cup of liquor you should use between a quarter to a half ofÂ a pie, 1-3 teaspoons of cinnamon, and a tablespoon of sugar. You can leave the sugar out if you like. 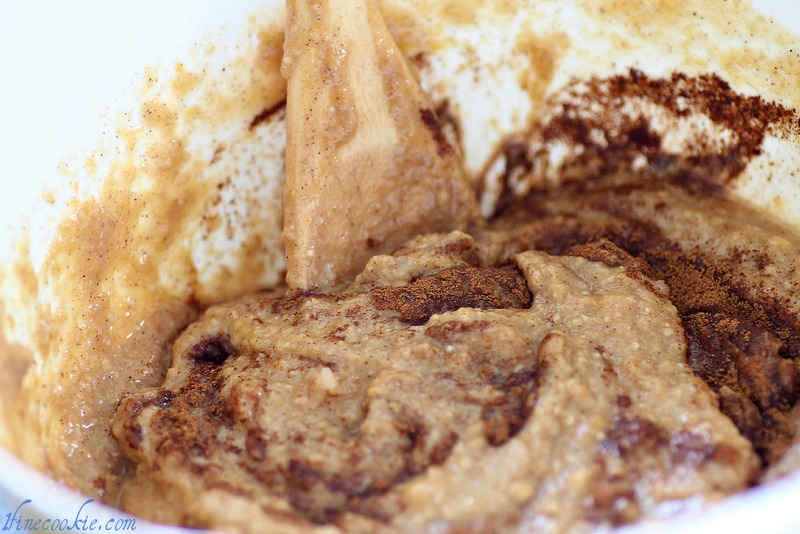 Cinnamon depends on how much you like its flavor. I used a little less than 2 teaspoons. The sugar helps cut the sting of the liquor, but if you use a good quality liquor and plan on infusing it for a long period of time then you may not need it. If you want a shot that is like creamy pumpkin pie, then use half of a pie. You will not need to let the pie sit in the vodka or liquor for very long. I stored mine for about a week. Let me clarify this whole infusion thing. I stored mine for a week, but I can handle a very strong vodka shot. If you like more of a girly shot,Â you will want toÂ addÂ MORE SUGAR, use MORE PIE, LESS VODKA, and A LOT MORE TIME to let it sit. These are one of those recipes, where everyone’s opinion of a good shot will differ so you will need to use YOUR own judgement. Shake it and taste it every few days to see how the mixture is coming along, and to decide if you need to add more of an ingredient. If you like girly drinks with little liquor flavor, then obviously a few days of infusion is not going to work for you. Sorry, but if you are picky, then you will have to be much more patient. 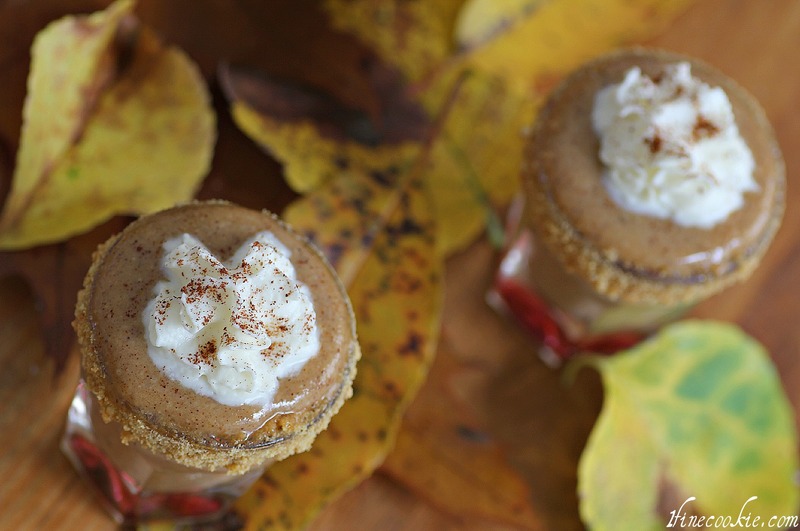 If you want to just have vodka with the infusion of pumpkin pie flavor,Â versus a creamy and much thicker pumpkin pie shot, then use a quarter of a pie or less. You will need to let it sit in the vodka for much, much longer, until the pie really breaks down so that you can filter it out more. Now begin by pouring all of your ingredients into a bowl and breaking the pie down really well with a spoon. You could technically use a blender, if you wanted to. Once mixed together, pour into a mason/canning jar. I used an entire pie with about a cup of vodka, so I had to divide the mixture between two jars. Let it sit for as long as possible. I don’tÂ believe you needÂ to keep it in the fridge (liquor tends to preserve) but I felt paranoid so I stored mine there anyway. I want to only get rid of the large chunks. If you are going for the flavored vodka, you will be using a cheese cloth. You will probably also have to filter more than once. Mix it around until it begins to filter through. If you are going to be using the cheese cloth, then place the cloth into the sieve. Mix with spoon. You can squeeze the mixture in the cloth to get out more vodka. It will be more work, of course, to filter out aÂ more “pure” vodka. 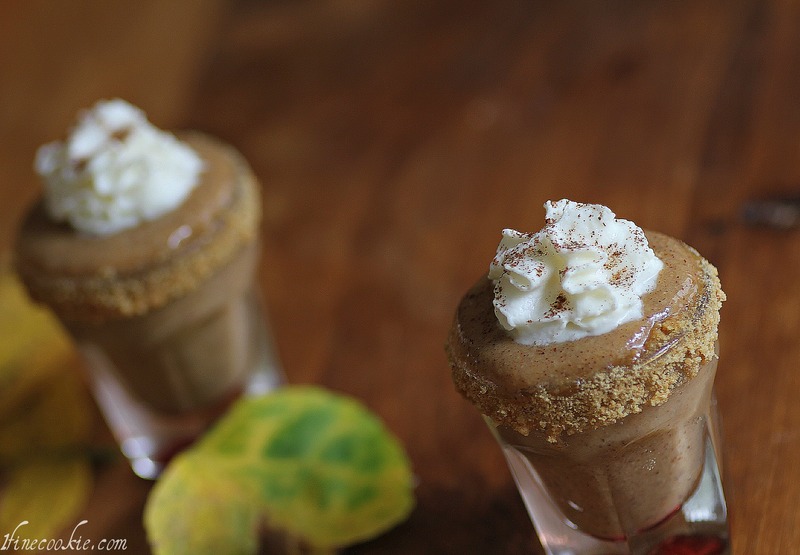 When ready to serve, dip the rims of your shot glasses in melted butter then roll in graham cracker crumbs. 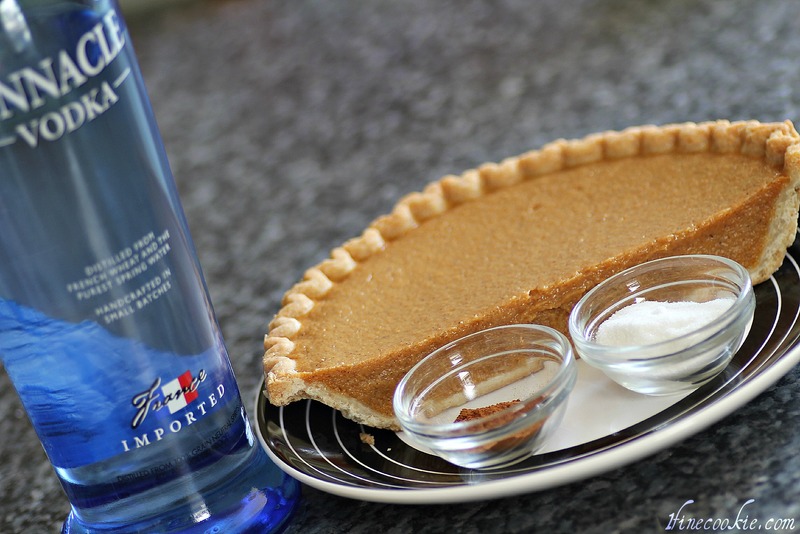 Pour in pumpkin pie vodka. 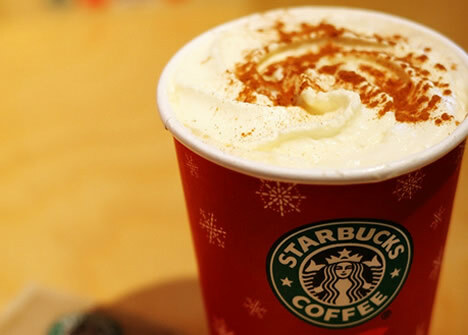 Top with a dollop of whip cream and garnish with a sprinkle of cinnamon. If you do not like sweetness, then leave out the whip cream. Now here is a good reason to celebrate Autumn. You got MY attention ! They look amazing Jazzy Fizzle! I’m salivating at work right now. Two questions. Do you sell them and do you take your own pictures? And yes, I take my own photos. I’ve come a long way, but I still have quite a bit to go! @trisha yeah BxTxH!!! If anyone asks for recipe, refer them here. Even better with Frangelica or Irish cream. May want nutmeg and not as much cinnamon. I.LOVED.THIS.POST. Your shots are inspired and I loved your take on the pumpkins! I’m so glad I came across your blog, I will be back for sure! I feel the EXACT same way about fall! Although I’ll add another few reasons I love it: pumpkin everything and bonfires. Great idea with the vodka too, totally going to try it and make some martinis for Halloween! @ Jen, actually, so long as the bonfire is large enough to keep me warm, then I agree with you. Just attended one last weekend, and porbably ate about 8 marshmallows. I cant wait to try these for our halloween party! How many shots did the recipe make when you used an entire pie and a shot of vodka? Thanks!! @ nicole, I only poured out the two shots for the photos (and totally saved the rest for my own personal abuse this coming Halloween). I don’t think one shot of vodka will be enough for an entire pie.. Is that what you mean? Since some people will use more vodka, and others use less, as well as pies being different sizes and thickness, some will use the crust while others may leave that portion out, and some will filter more or less than I did, it really depends. I suggest mixing and breaking down the ingredients in your bowl. Then, use a shot glass to transfer the pie mixture into your jar, counting as you go. However many it takes, it will be a little less when you filter. If you use a blender to break down the mixture, you will get even more shots. I would say that my own personal mixture probably makes about 6-8 shots per half pie used. I see you used Pinnacle vodka….what about using their whipped cream flavored vodka? @ Stacey, I think I wrote it either in the post or on my FB fan page that whipped cream vodak would work nicely. I was just too lazy to go out and buy it. Typical me. I may try this. Sounds yummy. I did make cucumber vodka this past summer for cucumber mojitos…wow, so tasty and refresing on a hot day, or poolside. agreed. I just wanted to share about the cucumber vodka. it was my first attempt at making my own infused liquor. Hope you don’t mind, but I used this recipe on my blog! & I gave credit!, But, instead of one photo, I used two… if that’s an issue, let me know on a comment on my blog. @Shona, I absolutely do not mind, and two are okay. Esp since you took the time to let me know. Cute blog! @Shannon, I’m sure my parents would have bought a leaf blower, but my guess is that they were not either popular or available for consumers.. When I have a yard I will def have the most efficient way of getting rid of those pesky leaves…or just lose patience and chop down every tree. Could this be done without alcohol and still taste good?? @ Jessica, sure why not. You could use some skim milk and blend it all together. 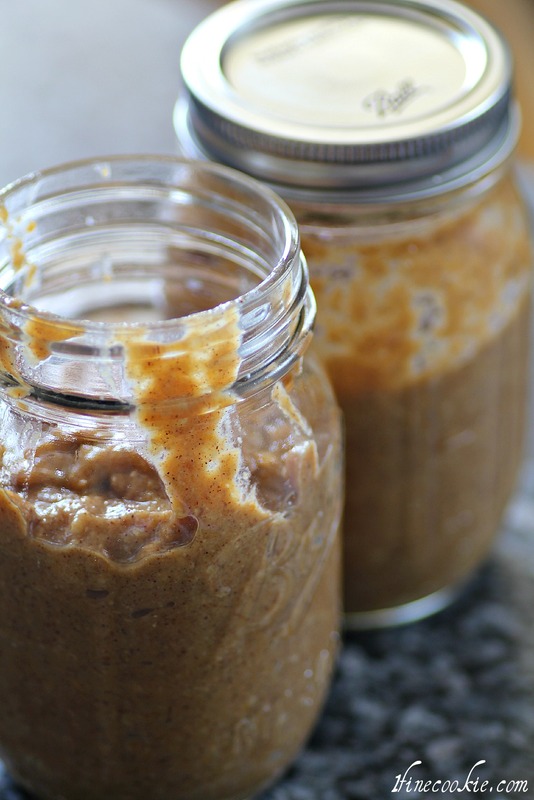 No need to let it sit in a jar (the milk would grow sour and expire). Just blend together and serve. 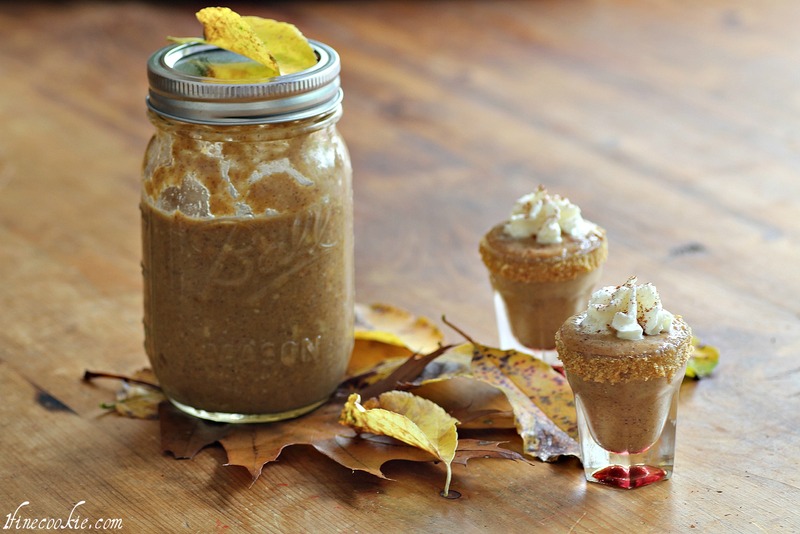 Where did you find the shot glasses pictured in the recipe? Love their bistro style! Good choice! @April, I actUally found them at Ikea! Great find, no? It was on the bottom floor in the Kitchen area where all the glasses were. These look fabulous! I can’t wait to make them. 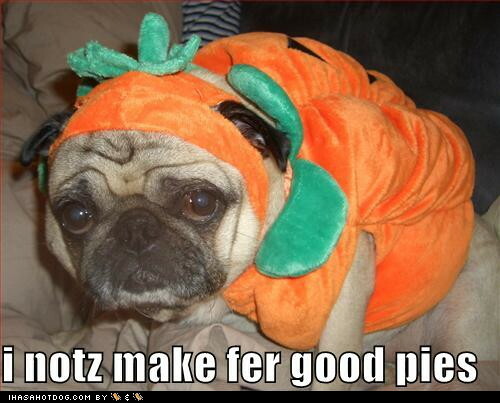 One question, did you use the crust from the pumpkin pie? Wondering if it alters the taste or not. @ chris, I did throw in most of the crust. It probably would not make a hug difference in flavor, since crust has a subtle flavor in comparison to the pumpkin filling and the liquor. It will, however, make a difference in thickness (thinner without the crust). Enjoy. 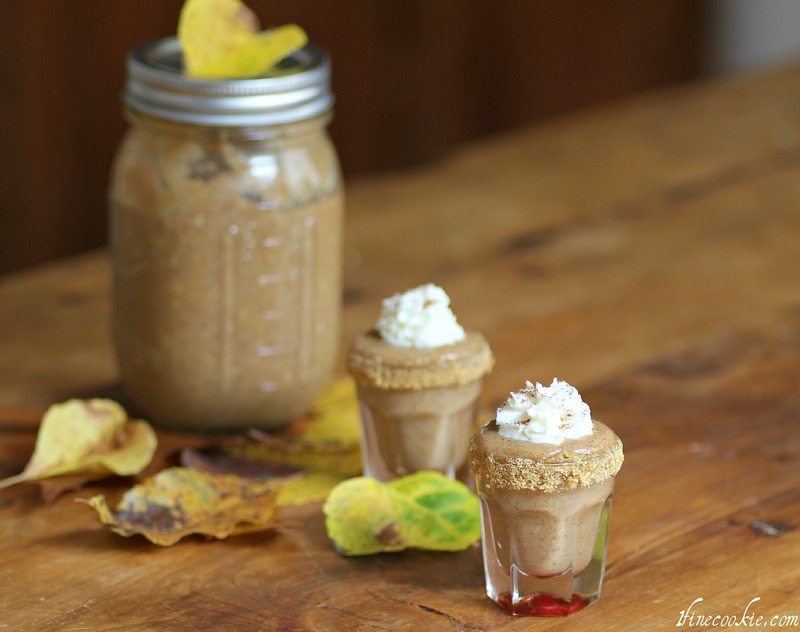 I love pudding shots so this is a “must make” for me! I wonder if you could do the same with an apple pie? @Teresa, technically, yes you could. I would warn you that the results would be different in that you would have to strain out the vodka and end up with more of a flavored vodka than a creamy shot. Can this be saved without refrigeration and given as a gift? @Sheila, I kept mine in the fridge as I felt warm shots were not very appealing. The only liquor I have kept outside of the fridge for long were with candy. That being said I don’t see why it wouldn’t be okay out if the fridge. The alcohol does preserve many foods, so it’s worth a shot. Filter the liquor out, pour into a pretty glass bottle with a bow and it would make a lovely gift. @Alissa, What do you see? There should be a recipe with photos. i didn’t read the part about waiting a week and i really wanted to make these xmas day 2 days away… can i make them that morning or will they not be good?! @Autumn, use a very good quality liquor that isn’t as strong. Add extra cinnamon and nutmeg, as well as more pie. PurÃ©e or mash up the pie as much as humanly possible. Shake the jar constantly. It will be very strong, but so long as everyone can handle a string shot it may be doable. Touch of Goldschlager floated on top of that. Light with butane lighter or torch. I would still let it sit and infuse. If you plan on drinking right away, if you must, then use a simple syrup instead of sugar. It will not taste the same, obviously, but it will taste good if you use the right amount if ingredients. You may need to strain. @jull, I take that as a compliment. Jasmin, does this require straining or can you just mix, puree, marinate, and serve? Hello! How long an these last in a sealed mason jar container? Fairly long, if you keep all ingredients submerged in vodka. In the beginning of your desc4you kentioned using 1/2 pie with each cup of vodka and that you like a strong shot. Then in the end you said that you used a whole pie and a cup of vodka. Did i read that wrong? So if i use 1/2 a pie with a cup it will be a lot stronger than if you use a whole pie, right? So excited! !! So when u made the the shots in the picture, you filtered those? Was it just a regular colander? @jess, I will have to go back through and look when I get a chance, but yes, the more pie you use the less you can taste the vodka. Also, the more pie you use, the more thick the texture will be. 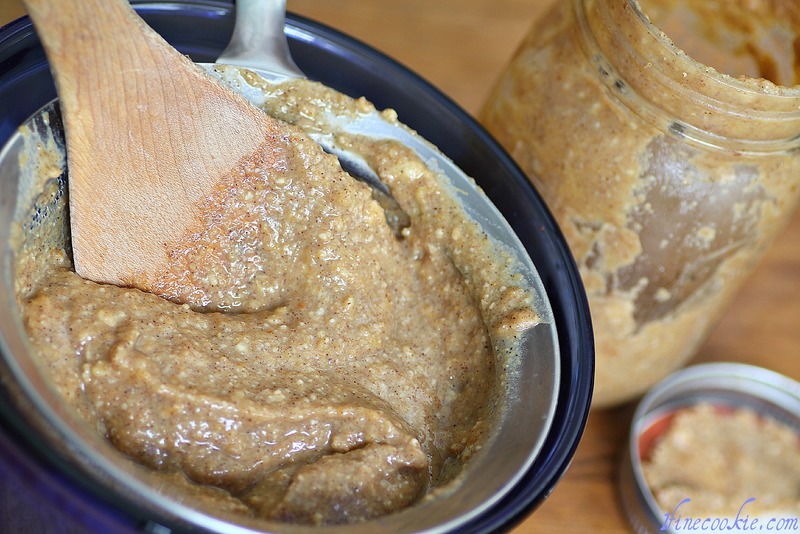 It could be almost pudding-like if you use a lot. I did not use a colander, but a sieve. Colanders are for pasta and such, to filter out water. Sieves are often used to separate out chunks. Oh no! I really want to make these, as I have a “Friends-giving” tomorrow. Overnight is not long enough to let sit, is it? It has to be a whole week? @vicki, you can certainly try. Maybe tell them to let it sit for a little while. Use very good quality liquor without any bite. Perhaps pumpkin flavored, if they sell that (or any complimentary flavor). I just came across this recipe and it’s the best one I I have seen thus far. I was just wondering how this would weather as a Jell-O shot? I was thinking about adding unflavored Jell-O mix to your recipe after the infusion/straining process and then letting it sit as you would with Jell-O. The reason is because I think these would taste amazing in mini graham cracker crusts. Perhaps this is wishful thinking, and perhaps the possibility of this recipe resulting in the Jell-O consistency is crazy unlikely, but alas, here I am wondering if MAYBE it would be possible. What do you think? the issue with unflavored gelatin is that it must be dissolved in cold liquid, then added to hot liquid (at least how it is traditionally done). If you just added it to a non-liquid mixture, I suspect it would end up either not reacting at all or clumping up.